It's a dark summer night and we open the patio door. I switch on the night light. It's the night before garbage pick up and my son ties the tie on our last trash bag for the weekly pick up. Off to the left in the corner of the patio step is a web. He inspects it. "It's a black widow. Holy Cow! I'm going to spray it and then carefully place it in a jar, very carefully." He identifies it by the red hourglass shape on its abdomen. It packs a venom as strong as a rattlesnake bite. And this one is a mature female about 1"long. Now I'm listening because if he misses, this "spider woman" will become aggressive. I don't fear spiders and most are good insect eaters. After this catch, I think I'd better take some of these creatures very seriously. Easy to say they are nocturnal and not interested in biting humans for no reason -- but neither are rattlesnakes! If bitten, go to the emergency room immediately. You life will depend upon it. Without urgent care, death may follow. Don't kill any spider. They are necessary in our ecosystem and most are quite harmless. Bell and Howell makes an ultrasonic pest repeller for indoors . I have placed one in each room. It is for rats, mice, spiders, ants and roaches. So far, after 2 weeks, I have had complete success and it really works! 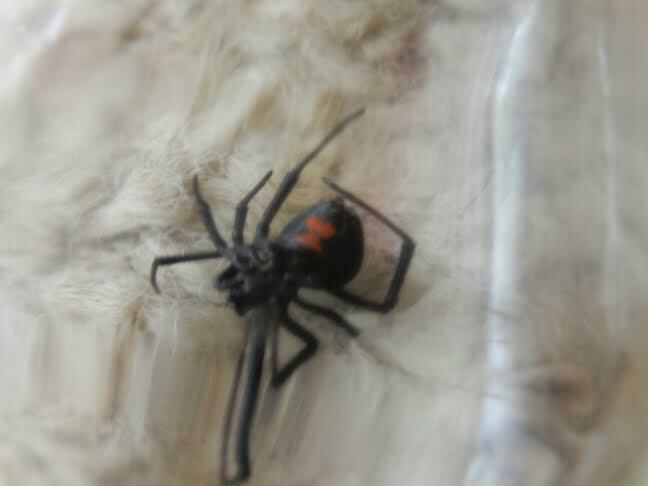 * For more information on the elusive Black Widow, go to www.wiki.how and google your question. Gads -- Thanks for this important, life saving information! !